1. Preheat the oven to 180˚C, gas mark 4. Put the potatoes in a colander and hold under running water for 5 minutes to wash off the starch. Drain, place in a large pan, then cover with cold water. 2. Add the bunched lemon thyme and lemon zest. Put the lid on the pan, bring to the boil and simmer until the potatoes are very soft and starting to crumble (about 20-25 minutes). Drain carefully; leave to cool in the colander. 3. Meanwhile, put the beef dripping, olive oil and garlic in a roasting tray large enough to hold all the potatoes in a single layer. Put in the oven for 15 minutes to heat the olive oil and dripping. 4. Add the potatoes to the tray. Stir to coat in the oil and place back in the oven, gently turning every 20 minutes. 6. After 1-1 ¼ hours the potatoes will be nearly done. 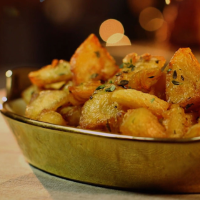 Add the remaining lemon thyme to the potatoes and return to the oven for 15 minutes or until the potatoes are golden brown and crispy. 7. Drain in a colander then sprinkle over the lemon thyme leaves and season to taste. This recipe was first published in Mon Nov 23 16:24:38 GMT 2015.